Matt Stutzman was born with no arms. He hasn't let a little thing like that slow him down though. He does most things that other folks do. He eats, drives a car, and rides a motorcycle, all using his feet. He has no handicapped sticker on his car and the controls have not been modified. He purposely challenges himself to do any and everything a “normal” person can do. 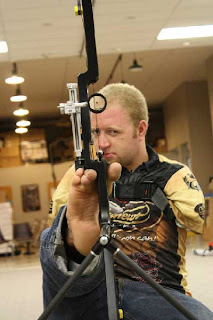 Matt Stutzman has now qualified for the National US Olympic team in archery. Out of the thirty people who tried out that day, Matt had the highest score. Two others qualified. In July, Matt will be going to Italy for team trials. If he qualifies there, and he is confident he will, then it’s off to London in 2012 for the Summer Olympics. Matt’s goal is a Gold Medal. He is confident he will win The Gold because the target at the Olympics is larger and closer than what he practices with.